As the semester has ended, we bid our seniors a farewell. Some of them consisted of officers, and other consist of members that actually made a difference in the chapter. We will definitely miss these individuals. 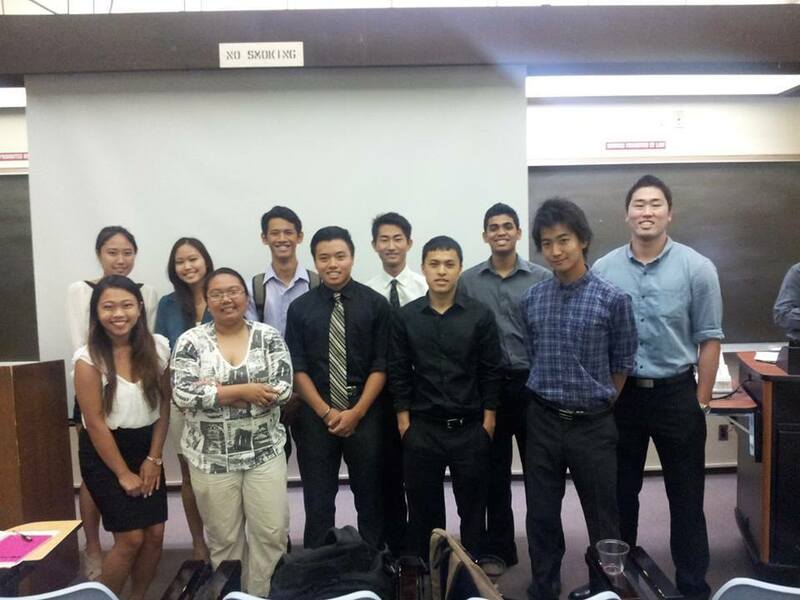 As they move on into the Oahu alumni chapter, we hope we remain in close contact with them. GO CLASS OF 2014! As the semester nears to a close, Rho Chi welcomes in 13 newly initiated brothers of the Delta class into its family! They have all proven their worth to be called Deltasigs and will definitely provide the chapter with more dynamism and strength for our chapter’s near and far future. Travis Tsukyama’s nine-week pledge process proved to be a challenge that pushed the newly initiates to hone onto their time management and test their true commitment to DSP. Many exciting events are just around the corner for Rho Chi such as the Barbeque Extravaganza on April 19, 2014 with Pi Sigma Epsilon and Entrepreneur Club. PIN night is almost here as well and will be on April 23, 2014, where brothers will have the chance to interact and network with a variety of professionals from around the island. At the end of that week, some brothers are visiting the Lamda Psi chapter for a small conference in Hilo and then hurrying back for Super Clubs Day the next morning (The biggest competition between all the business clubs of Shidler that tests all clubs’ abilities in football, volleyball, dance and relay) on Sunday, April 27, 2014. We hope to finish the year strong and bring home the trophy for all of our graduating seniors as a last hoorah. This is only the first semester of our breakout year for Rho Chi and we hope to continue our rich tradition of excellence as we move forward with our new Delta class. We had a successful Krispy Kreme fundraiser. Thank you to our Director of Fundraising, Susan Yogi, for putting it together! LEAD at Long Beach this spring, and a lot of the brothers were able to attend! We had a Big Lil BBQ Bonding day! Thank you to our Senior Vice President, Jamie Uy, for organizing it! We had a joint social with other business clubs in Shidler to practice for Super Clubs Day. Shout out to our VP of Socials, Stetson Shimamoto, for making it happen! We had a great company tour at the First Hawaiian Bank. Thank you Lily Nguyen, our VP of Professional Activities for organizing this event. Pledging has begun, and our Delta class consists of 13 pledges for Spring 2014! 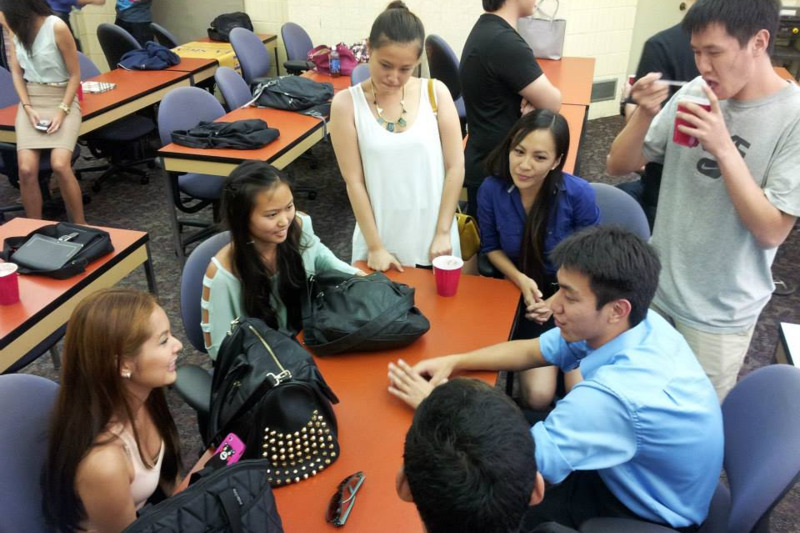 They are going to have a great pledging process with the help of our VPPE, Travis Tsukuyama. Also, the night before was Back to Business night with all of the Shidler clubs. Thank you to our IBC Senator, In Sik Seo for all your help with this event! Rho Chi wishing everyone a Happy New Year and all the best for the new school semester! It's almost that time again--recruitment week. Be sure to find Rho Chi brothers around UH Manoa campus next week to see if our organization is a fit for you! A culmination of rich tradition, a highly respected professional image and the promotion of fraternal values and principles achieving a well-resourced operation that yields value and opportunity to its brothers. We will be tabling at Shidler College of Business from Tuesday January 21 through Friday January 24. We will also be presenting in Business, TIM, as well as Economics classes. Do not hesitate approaching a brother to find out more details with recruitment and pledging. Rho Chi and its brothers are searching for motivated, eager, and passionate individuals to join this lifelong brotherhood. Our application is open and available in our "Become a Brother" tab and can be submitted via email or in person. We wish everyone the best of luck this semester and see you around campus! September 19- Pledging Ceremony! We initiated 11 wonderful recruits and they are currently under going the 8-week Pledge process!! They also have been given their "bigs" and are meeting the rest of the brothers as they progress along the semester. We are excited to have their big Initiation Day ---it's right around the corner, November 16! September 29 - HAPPY BIRTHDAY RHO CHI! We had an amazing Sunday celebrating our installation date as Rho Chi Chapter last year in 2012, and even celebrated with some brothers from the Hilo Chapter (Lambda Psi) and some Alumni! Can't wait for the next Birthdays! October 1 -FUNDRAISING Bubbies Tickets! We are selling Bubbies tickets ($10/8pieces) with the following flavors: Strawberry, Green Tea, Vanilla, and Chocolate Espresso! Every brother and pledge will be selling tickets and pick up will be at Campus Center on Monday November 4 from 10am-4pm!!! Support RHO CHI! October 2- Blood Drive! We had our second Community Service Event and recruited 20 amazing volunteers to donate blood for Blood Bank of Hawaii! This is our second time collaborating with Blood Bank of Hawaii and we look forward for a bigger turn out next semester. We also have finally confirmed our Faculty Advisor, who is Statistics Department Head, Daniel Port. Daniel Port is also the Faculty Advisor for Information Technology Management Association, another student organization at Shidler. We had so much fun meeting those of you who came out to meet the Brothers of Rho Chi! 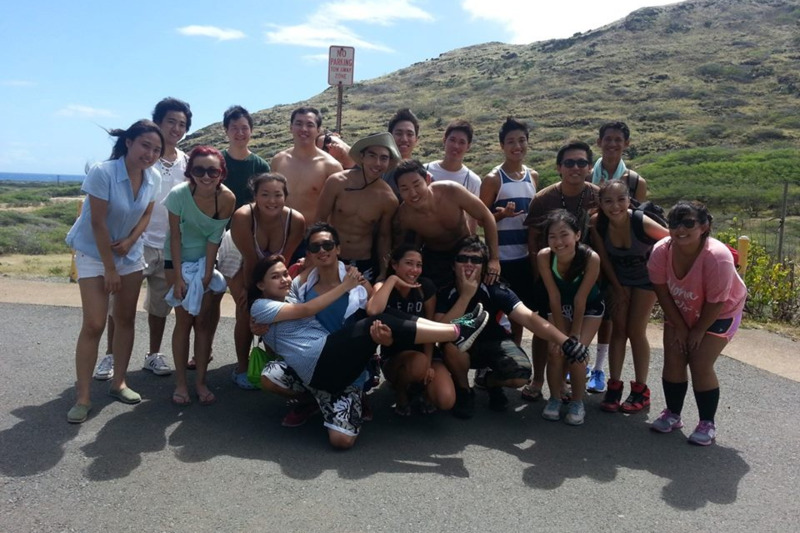 It was the perfect day to hike Makapu'u and get wet in the water (although some of bros did get hurt). Next event is this Wednesday in BusAd D203 and it's going to be an Alumni Panel! Please come and hear what previous Brothers of DSP have to say about their experiences! Attire is business casual and will be at 5:00pm! Thank you to everyone who came out to the first day of orientation! We had a blast meeting everyone, and we hope you all enjoyed the soda floats! For those of you who didn't make it out today, please come by tomorrow! Orientation day #2 will be in BusAd D203 at 5pm! Recruitment for Fall 2013 has officially begun! We will be tabling right outside Shidler College of Business (first floor, near men's restroom) for the rest of the week! Please be sure to stop by, say hi, and check out what we're all about! We CAN'T WAIT to see the new recruits we're going to get this semester!! Here is the info to our Recruitment Week + Open House! In addition, we will be tabling at Shidler College of Business throughout this week! Recruitment week is right around the corner! See Rho Chi avidly looking for potential brothers around UH Campus from September 3-7! We are also having our first ever Open House! Our Open House will be throughout the week of September 7-14 and will be a display of the various events we will hold throughout the semester. Dates will soon be posted!